When bungling cat-burglar George Dyer broke into Francis Bacon’s South Kensington studio in 1963, he would have been forgiven for thinking that another petty criminal had beaten him to it. 7 Reece Mews looked as if it had been ransacked: crumpled photographs, rags, expensive art monographs and empty crates of Krug were strewn over every available surface: slashed canvases were propped against the paint-smeared walls. Over the next few years, Dyer would often pose in that same room, wearing his saggy Y-fronts, modelling for various photos which ultimately joined the paint-spattered morass on the floor. “There [is] no need to do any housework…” droned Quentin Crisp in The Naked Civil Servant. 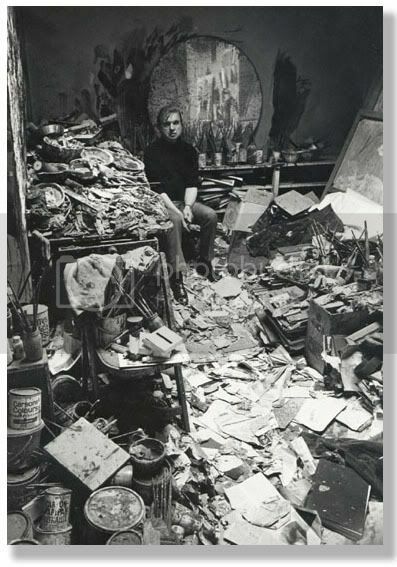 “After the first four years the dirt doesn’t get any worse.” Bacon’s studio was proof of Crisp’s theory; he worked there for the last 30 years of his life, and the detritus never significantly changed. According to his biographer Michael Peppiatt, the closest the artist came to “tidying up” was to shovel some of the debris into a bin bag, which he would promptly tip all over another part of the room. Francis Bacon claimed that he worked best when he was knee-deep in piles of dog-eared visual material, because it suggested images to him. Standing among these fragments he had shored against his ruins, the painter acquired an Eliotic quality: a man picking through the rubble of the culture in search of inspiration. He preferred to work from photographs rather than life models, and rated reproductions of artworks more highly, as source material, than seeing the painting itself. Alongside the stickleback bean-cans of coagulated paintbrushes and the pigment-smeared towels, the room was littered with images which had a strong resonance for Bacon: books on Munch, Rodin and Velázquez (whose 1650 Portrait of Pope Innocent X famously inspired the “screaming popes” of the 1950s); Eadweard Muybridge’s 19th-century photographs of wrestlers; studies of unsightly skin infections; and, more bizarrely, a biography of David Gower (a number of mutated nudes painted during the 1980s can be seen to sport the England batsman’s cricket pads). 7 Reece Mews, as accommodation, was penurious. The floorboards and lightbulbs were bare, and the walls whitewashed – at least until they became smeared with an Impressionist poppy field of pigments. The bombsite studio was only large enough for Bacon to execute one painting at a time, and was dominated by a huge circular mirror, speckled black with age, which dated from his time as a Modernist interior designer. Bright Young Things who were wondering about “The 1930 Look in British Decoration” could have seen it alongside his steel-tube furniture in a feature in The Studio magazine of the same year. There were only two other rooms in the place: a poky living room/bedsit affair, and a rather unsavoury room which combined the functions of bathroom and kitchen, in which the moon-faced painter could do the washing-up while gazing at faded reproductions of his triptychs. That an artist at the peak of his fame, capable of selling paintings for six-figure sums, should continue to live in rented squalor for three decades seems incongruous. Bacon was far from tight-fisted – he led an extravagantly bon vivant life in the boozers and restaurants of Soho, running up thousand-pound weekly bills on champagne alone – so this was not the reason for his humble surroundings. He tried to move out on a number of occasions, but always found the South Ken pad to be the most conducive to creativity. Bacon was an admirer of Giacometti’s notoriously run-down studio in the Rue Hippolyte-Maindron in Paris, and clearly considered that his own shambolic studio lent him a similarly bohemian mystique. The pair had become friendly when the creator of bronze twig-men visited London in 1965; a photo of Giacometti lies among the many hundreds in the studio. When Francis Bacon died, in 1992, the dust of raw pigment that had played havoc with his asthma was allowed to settle. It soon became apparent to the artist’s estate that the Augean studio was something of a self-mythologising work of art in itself. The accumulation of 30 years of brushes, corduroy trousers and, most importantly, reams of creased inspirational material were a carefully considered extension of the artist’s romantic self-image, and could make a significant contribution to the advancement of learning about Francis Bacon’s work. Despite discussions, the studio was not sold to the Tate – it might have made an intriguing counterpoint to Tomoko Takahashi’s artfully arranged piles of rubbish in the 2000 Turner Prize show. Instead, the Hugh Lane Gallery in Dublin snapped it up. Before the entire contents – and, indeed, the walls – of 7 Reece Mews were shipped across the Irish Sea, Perry Ogden went into the studio and meticulously recorded every paint-flecked inch of the property in an evocative series of photographs, which have been collected in a book. The pictures have a forensic quality: the rooms of the cramped Kensington mews house were shot from every possible angle; the piles of litter were then documented in numerous close-ups. Even the bookshelves were assiduously chronicled, revealing the erudition of Bacon’s reading – Joyce, Aeschylus, Nietzsche, Greek Made Easy and Viz. Just as in the aftermath of a plane crash the smallest fragment of debris is numbered and catalogued, so every one of the 7,000-plus objects scattered across the floor was itemised and compiled on a database. With the assistance of this, Ogden’s photographs and archaeologists’ plans, the entirety of the studio room (and the rickety wooden staircase leading to it) has now been re-created as a permanent art installation in Dublin, for the public to visit. The artist was born in Ireland (albeit to British parents), so moving his studio to the Hugh Lane Gallery, in a sense, brings home the Bacon. First published in World of Interiors issue 225. Reproduced with permission.